One of the best things about working with a Windows 7 computer is the amount of customization that you can do to make your computer as easy to use as possible. Whether you are changing the display settings for your files and folders, or adjusting the picture that you use for your Desktop background, there are many options to personalize your computer. 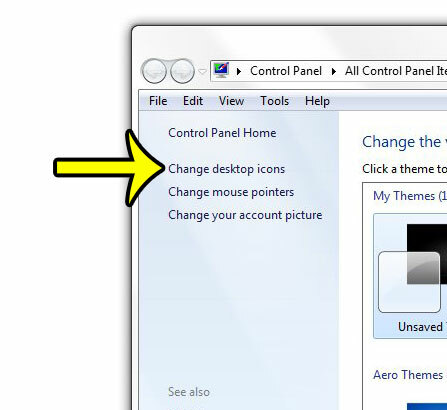 One other setting over which you have control is the icons that are displayed on your Desktop. One of the icons that you can choose whether or not to hide is the Recycle Bin icon. 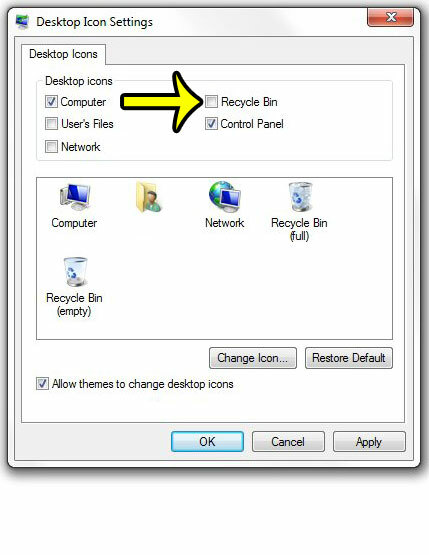 Our guide below will show you how to add or remove the Recycle Bin icon from your Desktop in Windows 7. 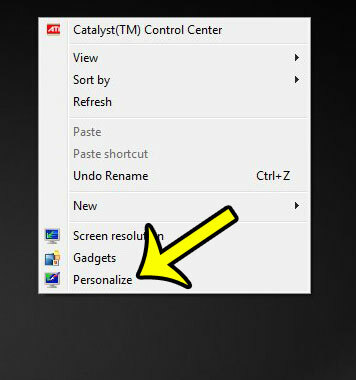 The steps in this article will direct you to the Personalization menu in Windows 7, where you can elect to either show or hide your Recycle Bin icon. If you elect to show the Recycle Bin icon, then it can be found on the Desktop. You can empty the contents of the Recycle Bin by right-clicking the icon, then selecting the Empty Recycle Bin option. Note that deleted files will still be sent to the Recycle Bin, regardless of whether or not you have elected to display the icon on the Desktop. 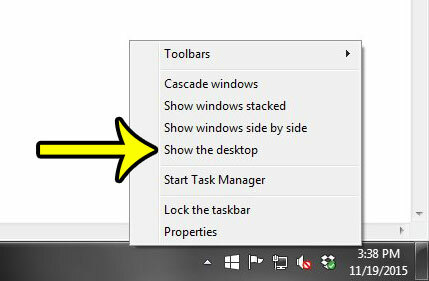 Display your Desktop either by minimizing or closing all of your open windows, or by right-clicking on the taskbar (the horizontal bar at the bottom of the screen) and selecting the Show the desktop option. Right-click in an empty space on the Desktop, then click the Personalize option at the bottom of the menu. Click the Change desktop icons option in the blue column at the left side of the window. Click the box to the left of Recycle Bin to hide or display the icon. If there is a check mark in the box, then the Recycle Bin will be displayed. If there is no check mark, then the icon will be hidden. Click Apply at the bottom of the window, then click the OK button close the window. Do you need to add some new folders to your Desktop to make it easier to locate your files? Learn how to create new folders in Windows 7 and start organizing today.